A skybox is a texture that you apply to the background of a scene to show the sky, space, or an enclosing structure. A skybox can be a single texture that wraps onto a sphere, or six textures that wrap onto a cube. 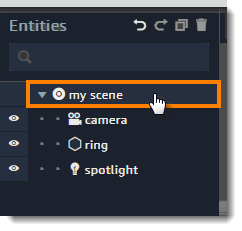 Add a skybox to your scene in the scene's environment settings. 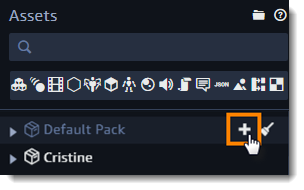 Click the plus icon next to the default pack. To see the icon, select the pack name. Choose the shape of the skybox. Box – Six square images that map onto a cube (cube map). Sphere – A single rectangular image that maps onto a sphere (equirectangular projection). Drop a texture asset or image file on each section of the skybox. 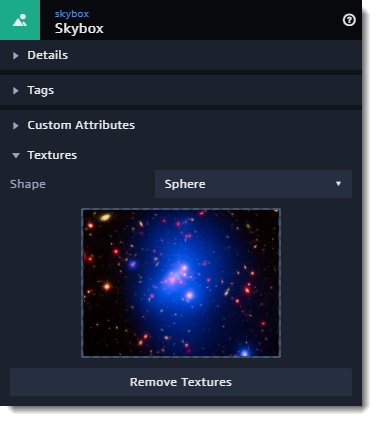 Drop the skybox asset from the assets panel onto the Skybox field.